This is the dessert I made for Mother’s Day. That I wanted to share before Mother’s Day so that I would be giving you a great Mother’s Day recipe. But… that was a bad week, kitchen wise, and I just wasn’t sure that it would be worth sharing. In fact, even though it looked amazing, I was actually fairly certain that it would be a disaster when we tasted it. It was just that kind of week. I was so sure of this, that I made a second dessert – you know, for options – but mostly so there would still be dessert when the cream puff one was awful! I’m happy to say that it was not awful. Obviously, or you wouldn’t be seeing it here. Either was the other dessert. So mostly it just made for a tough choice, which ended up being okay. Because when you have a choice between two desserts and can’t decide – you just have both. Obviously. I’m glad I wasn’t alone in this decision – pretty much everyone there agreed that that was the right call, and there really weren’t a lot of leftovers. And before you judge us too harshly for that, there were 15 people there, so we had small slices of each! This lemon strawberry cream puff cake was the winner though I think. It was absolutely divine. 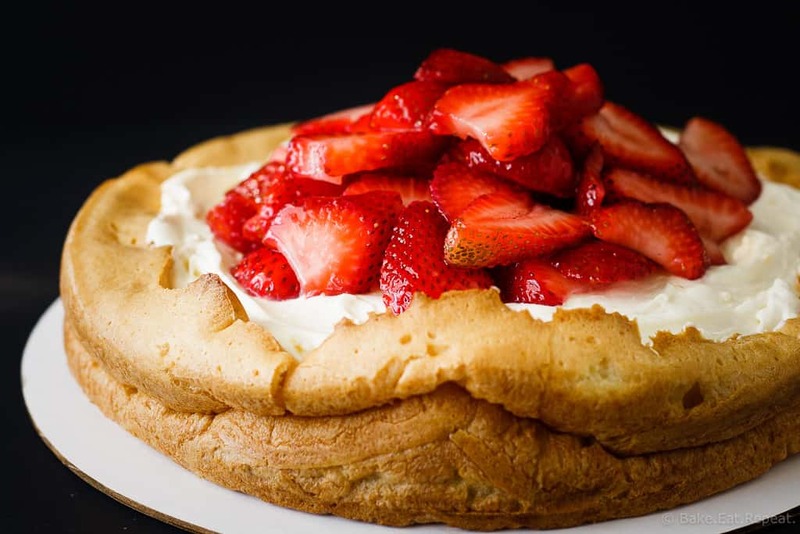 A giant cream puff shell, with a layer of sweet lemon curd spread on the bottom, filled with a sweet lemony cream cheese and whipped cream filling, and topped with sliced fresh strawberries. I was surprised at how good this was. Although really, I shouldn’t have been. 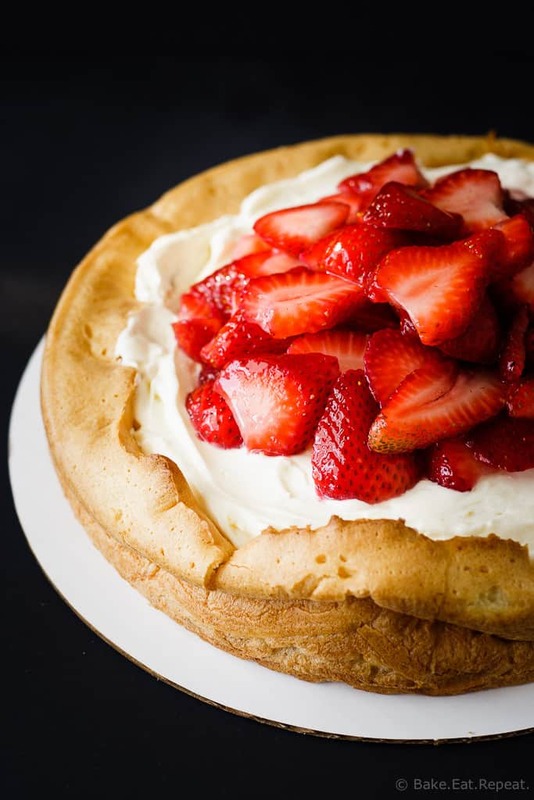 A cream puff with lemon curd, whipped cream and strawberries? How bad could it be? Not bad at all it turns out. In fact, pretty amazing. And an absolutely stunning looking dessert that tastes as great as it looks and is perfect for a special occasion. Or a Tuesday night. Your call! Note: Don't be scared off by the long recipe - all the components are easy to make, and can be made ahead of time! Keep the prepared cake in the refrigerator until ready to serve, although I wouldn’t recommend assembling it too far in advance or the cream puff shell may become soggy. Mine was still crisp after about 3 hours in the fridge. The separate components can be made ahead of time, I made everything the day before serving it, and then assembled it the day of, I just left the cream puff covered at room temperature. I did find that it had lost some of it’s crispness, so to crisp it up again I placed it in a 225 degree F oven for about 10 minutes and it was nice and crisp again before assembling the cake. Prepare the lemon curd. In a small bowl, whisk the 2 eggs and one egg yolk together, then whisk in the sugar until combined. In a small saucepan over medium heat, heat the lemon juice and zest until hot, but not boiling. Slowly pour the hot lemon juice into the egg mixture, whisking constantly while pouring. Return the mixture to the saucepan and cook over medium heat, stirring constantly with a wooden spoon, until the mixture is thick enough to cling to the back of the spoon, about 3 minutes. Remove the pan from the heat and stir in the butter until combined. Stir in the cream, vanilla and salt. Pour the mixture through a fine mesh strainer into a small bowl. Cover the lemon curd with plastic wrap directly on the surface of the curd and refrigerate until ready to use. Make the cream puff. Preheat the oven to 375 degrees F. Lightly grease the sides and bottom of a 9 1/2 inch springform pan and set aside. In a medium saucepan, bring the butter, water and sugar to a boil. Add the flour all at once and stir the mixture quickly until it starts to pull away from the sides of the pan. Remove the pan from the heat and keep stirring until the mixture is smooth, then allow it to cool for 5 minutes. Using a handheld electric mixer, add the eggs, one at a time to the mixture and beat it until it is smooth and shiny. Spread the mixture in the bottom, and about an inch up the sides of the prepared pan. Bake for 30-35 minutes, until it is golden brown and crisp to the touch. Take it out and poke it all over, 10-12 times, with a toothpick (there shouldn’t be a lot of sticky batter on the toothpick after poking the puff, if there is bake it a little longer). Then turn the oven off, put the cake back in the oven and prop the door open with a wooden spoon. Allow it to dry in the propped open oven for about 30-45 minutes. Take it out to cool completely, I removed it from the pan at this point and transferred it carefully to a cooling rack. Toss the strawberries together with the sugar in a bowl and place in the refrigerator until needed. Prepare the cream filling. In a large bowl, or the bowl of a stand mixer, whip the cream cheese until it is smooth. Slowly add the powdered sugar, and whip the mixture until it is light and fluffy. Add in the heavy cream, lemon zest and vanilla and continue whipping until stiff peaks form. At this point, if you’re not ready to assemble the cake you can keep the prepared cream in a covered bowl in the refrigerator. Assemble the cake. Spread the lemon curd over the bottom of the cream puff shell. Then spread the cream filling over top of the lemon curd, and pile the strawberries on top of the cream filling. Slice and serve! Source: Lemon curd recipe from Cook’s Illustrated Baking Book and the cream puff cake is slightly adapted from Mel’s Kitchen Cafe . I made this for Easter and it turned out really nicely. I couldn't get the whipping cream to form stiff peaks after I added it to the cream cheese, so it was a little softer than I expected, but still really good. The lemon curd is beautiful and rich and the flavours really work well together. I actually added a little bit of lavender to add to the flavour complexity. How long will this hang in the fridge before serving? Hi Charlotte - I assembled the cake about 4 hours before serving and kept it in the fridge until we were ready to eat and it was fine, not soggy at all. I made up all the components the day before and they kept just fine too (I left the cream puff shell at room temp lightly covered in tin foil, and briefly re-crisped it in the oven the next day). I haven't tried, but I think that if you assemble it way ahead of time, the bottom of the cream puff shell may get a bit soggy, but it takes about 2 minutes to assemble it if all the components are ready to go! Let me know if you try it out! We ate what was left over from mine the next day and it was still tasty! This is such a gorgeous cake, Stacey! Love the cream puff base. It sounds perfect with the creamy lemon and strawberry filling! Strawberry and lemon belong together! And this cake needs to happen at our next get together! Strawberry and lemon DO belong together - so good! :) Thanks Meg! This cake is gorgeous! The lemon and the strawberry accent each other so well! Plus the creamy part of the cake looks amazing! It's hard not to do something with strawberries this time of year when they're finally good again! Thanks so much Neli! What a beautiful cake! How creative to make a giant cream puff! I'm not surprised it disappeared! This looks amazing Stacey!! Gorgeous photos. I've never made anything like this, but that needs to change asap!! Pinned! Does this ever look good!! I would never thought of a cream puff cake! Must give it a try! What a gorgeous dessert! The creamy filling looks so luscious and fluffy! It's beautiful. It is just so fancy and pretty, and sounds incredible! This is such a pretty cake, Stacey! And so creative too! I love the cream puff texture in here. Sounds amazing! I'm glad it worked out! Bad weeks in the kitchen are the worst. But something always comes along to save the day and inspire! It's so frustrating right? But this lovely dessert definitely helped! :) Thanks Mir! A giant cream puff?! I'm amazed! What a great idea! It looks and sounds amazing! Stop it. A giant cream puff?! This is brilliant. It has been way too long since I've had cream puff anything! And I love the lemon and strawberry combo -- definitely a winner in my books! I hate when I have a bad kitchen week, but this cake looks amazing! Yeah, it always helps when you end on a high note! Thanks Beth! This cake looks amazing! Just got a huge box of strawberries and will try it! Pinned! Legendary?! Well thank you! :) It WAS delicious! It looks absolutely amazing and I bet it tasted the same! This looks wonderful! 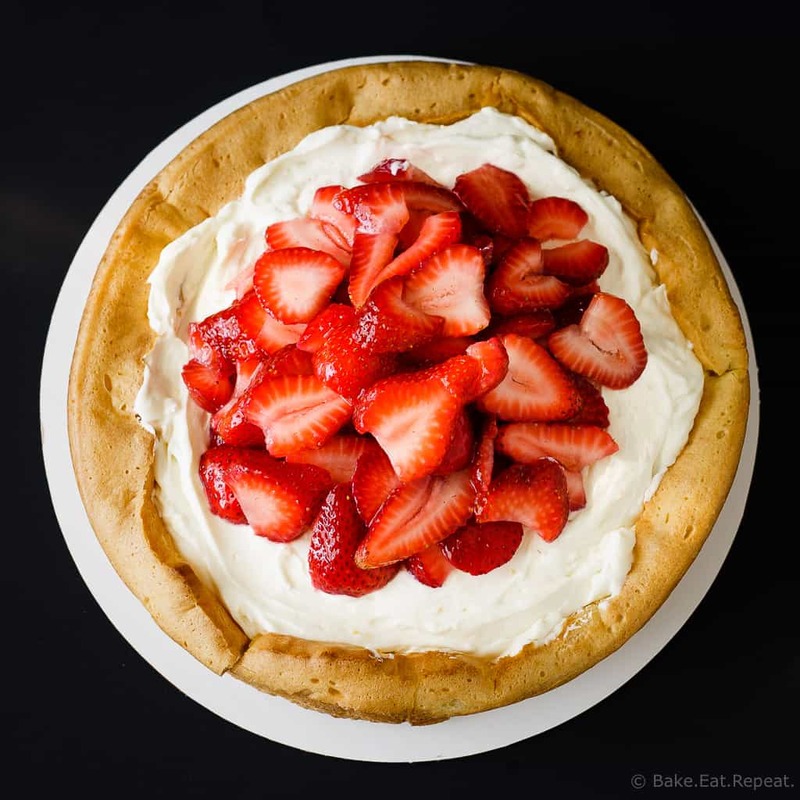 I always have leftover strawberry's in the summer so this will be a wonderful use for them!